Model: Vienna 114 C & D.
Description: The exterior of these jewels is lovingly designed based on the roots of the diatonic accordion tradition. To achieve this, the traditional “goldbrand” process is used, a complicated technique by which the wood, under pressure and heat, is given the desired structure before final finishing. Description: The instrument “Morgane” is highly regarded in the Gaelic and Breton music. Our diatonic accordions are demanded companions spread all over the world in Folk, Cajun, Zydeco, Vallenato, Blues… World Music. Description: For fans of Irish music, the special edition Double Ray is available in the tunings of B/C or C#/D. Description: What else does one need besides a couple of rows of buttons? Just a little good feeling. Model: El Rey Del Vallentano. Description: El Rey del Vallenato - The new King on the block! El Rey del Vallenato extends the Hohner economy line to a 3 voice model built especially for Vallentato musicians. 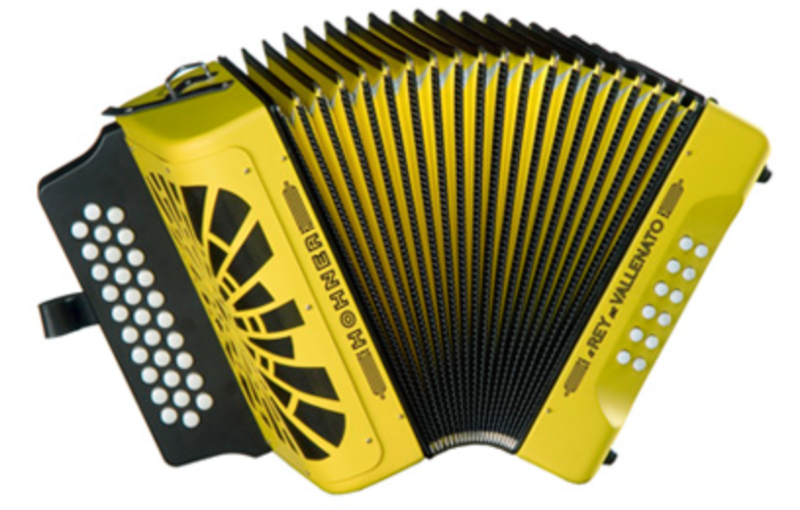 El Rey Del Vallenato is available in a wide variety of matte colors and key combinations. 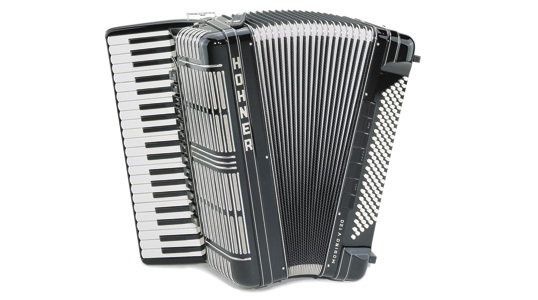 You'll hear even more of that famous Hohner sound booming from its newly designed wide open web-grille. El Rey del Vallenato features a handy adjustable bass strap,comfortably padded shoulder straps and a light, durable, protective gig-bag. Thinking Vallenato? ..think El Rey del Vallenato. Description: Available in a variety of new matte colors and a wide selection of key combinations, the Compadre is the 2 voice model for both entry-level or experienced players. An economy model with high on performance extras, the Compadre features an adjustable left-hand strap and a radically re-designed wide-open-web grille, allowing for even greater volume along with solid protection. The Compadre comes with double strap brackets, comfortable padded straps, and an easy to carry, resistant gig-bag. 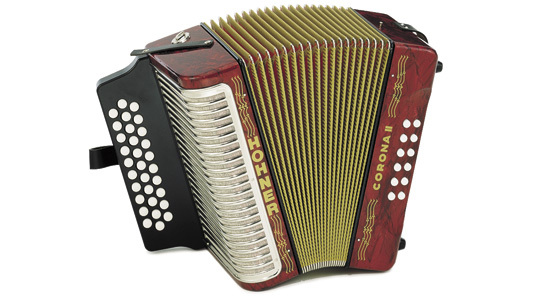 The Compadre is the new standard and affordable alternative in the Hohner economy series, and like its name, is a new friend and compadre to all Hohner accordionists. Model: Corona III V Xtreme. Description: As the Latin music scene develops, so grows the need for more extreme forms of expression. Hohner's new Corona Xtreme line addresses just those needs. 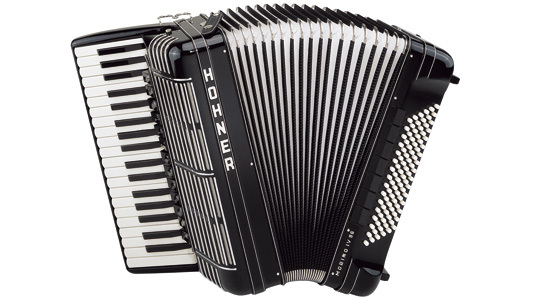 The Corona Xtreme provides more playing options and extreme comforCorona III V Xtreme, 3 voices per note in MMM double tremolo tuning and with a 34 button keyboard, the perfect combination for that classic Hohner Vallenato sound. Model: Corona III N Xtreme. Description: As the Latin music scene develops, so grows the need for more extreme forms of expression. Hohner's new Corona Xtreme line addresses just those needs. The Corona Xtreme provides more playing options and extreme comfort. Corona III N Xtreme, 3 reeds per note in MML octave tuning, with a 34 button keyboard and a full-bodied Norteno sound. Description: All Coronas can be played in 3 keys and Hohner offer instruments with 2 or 3 voices in different keys, so that you, as a musician, can take advantage of the great freedom it offers and develop your personal style to the utmost. In total there are more than 50 Coronas waiting to enrapt audiences all over with you. 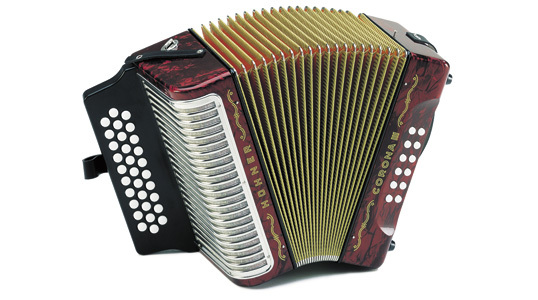 Description: The Gola represents the premium level of accordion building worldwide and is the instrument of choice for soloists of the highest level of ability (including numerous World Champions), whether on stage or in the recording studio. The combination of top quality materials and workmanship of the finest degree of precision results in superlative instruments for the most discerning players. Features: The rugged and musically versatile instruments in this series offer performance features which were up to now only available with considerably more expensive instruments. A good example is the Bravo’s incorporation of the T-keyboard mechanism. Colours: Red, Black, White and Dark Blue. Description: The rugged and musically versatile instruments in this series offer performance features which were up to now only available with considerably more expensive instruments. A good example is the Bravo’s incorporation of the T-keyboard mechanism. Description: The added fourth voice in the Amica 4-voice models brings 11 different timbres into existence. In addition to its excellent tonal characteristics, the Amica is noted for its ergonomic qualities; there are very few 4-voice accordions around which weigh less than 10 kg! Features: The exciting appearance of the Nova accordions is stamped by the grill. But it serves to much more than just a great impression. It helps to shape the assertive and unique sound of the Nova-Series by producing a well-balanced mix of low and high frequencies by means of precisely calculated sound holes. Model: Nova II 80 Light. Colours: Black, Dark Blue, Gold and Gold Glitter. 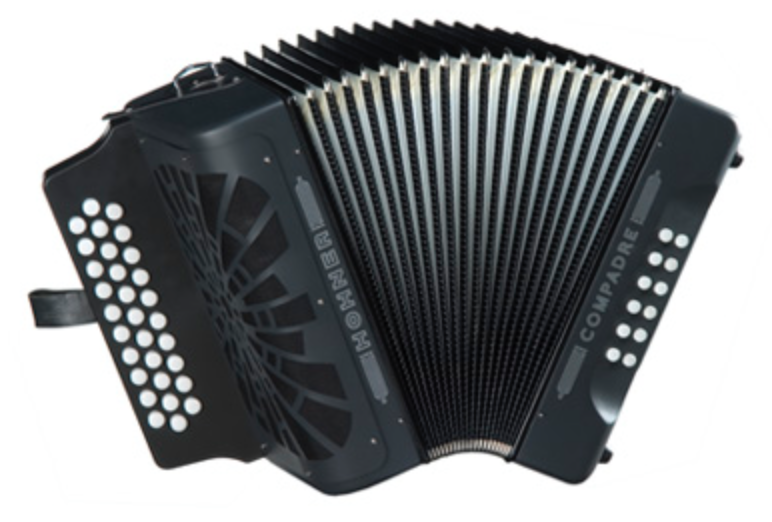 Features: To meet the needs of accordionists who are only satisfied with the best. Description: To meet the needs of accordionists who are only satisfied with the best. Model: Morino Tremolo IV 120. Features: On the stage Morino accordions will get a special touch. A special feature is the double Tremolo, which also is known as Musette -Tuning. For the soloist the sound will get very agile and thrilling, exact as needed and required on the stage. The different colours of the Tremolo models cause for a visual sensation. The Hohner logo on this model is made from semiprecious stones. Model: Morino Tremolo IV 96. Description: On the stage Morino accordions will get a special touch. A special feature is the double Tremolo, which also is known as Musette -Tuning. For the soloist the sound will get very agile and thrilling, exact as needed and required on the stage. The different colours of the Tremolo models cause for a visual sensation. Model: Morino + V 120. Features: It's the typical timbre, especially from the Cassotto, which gives these instruments their unique character. Model: Morino + IV 120. Model: Morino + IV 96.